Europe and Russia have close economic ties, including billions of dollars in the trade of goods and investment, making sanctions a thorny issue. Deep economic and business ties between Russia and Europe leave the West with limited options for responding to the crisis in Ukraine. 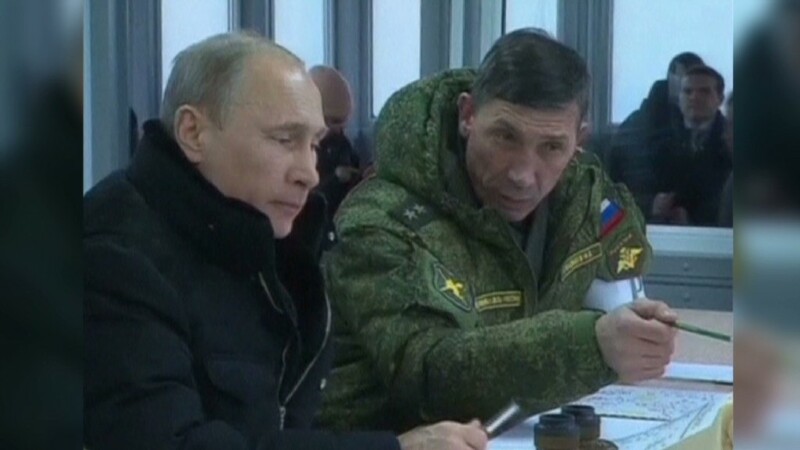 The deployment of Russian troops in Crimea has drawn condemnation from Washington and Europe, along with talk of potential sanctions if diplomacy fails. The United States has put trade and investment pact talks with Russia on hold, while Secretary of State John Kerry has talked about isolating Moscow through visa bans and freezing assets. But European leaders, who meet Thursday to discuss the crisis, have been more circumspect, instead emphasizing the need for diplomacy and international mediation. That's hardly surprising when you consider the extent to which the economies of the European Union and Russia are intertwined. With the eurozone still emerging from its own crisis, European leaders will think long and hard about any measures that might put that recovery at risk. "For now, the most likely outcome is some EU language stressing the real possibility of sanctions and potentially putting on hold talks on longer-term cooperation projects, while stopping short of actually imposing immediate restrictions on sensitive issues such as the mobility of capital, goods and people," noted analysts at Teneo Intelligence. 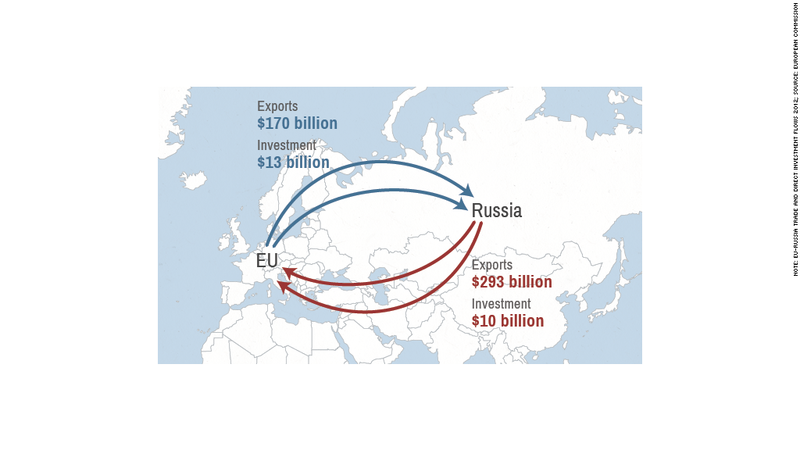 Russia is the EU's third-biggest trading partner after the U.S. and China. Trade in goods totaled a record 336 billion euros ($462 billion) in 2012, more than 10 times the volume between Russia and the U.S.
Add in exports of services, and the value of the Russia-EU relationship rises to $520 billion. Russia is the EU's single-biggest supplier of energy. Oil and gas prices rose sharply Monday on fear of supply disruptions through Ukraine, which account for about half of Russian flows. EU exports, meanwhile, are largely made up of machinery and transport, chemicals, medicines and agricultural products. Nowhere is Europe's reliance on Russian energy more acute than in Germany. Former German Chancellor Gerhard Schroeder is chairman of the shareholders' committee of Nord Stream, a joint venture between Russian gas giant Gazprom (GZPFY) and four big energy companies -- two from Germany, and one each from the Netherlands and France. Nord Stream has invested 7.5 billion euros ($10.3 billion) to build twin gas pipelines through the Baltic Sea, allowing Russian exports to bypass Ukraine. And British energy firm BP (BP) is the second-largest shareholder in Russia's leading oil producer Rosneft. "If and when any sanctions are placed on Russia, they are likely to be targeted on key officials rather than on the wider economy," said Neil Shearing, chief emerging markets economist at Capital Economics. "Europe is too dependent on Russian energy to countenance full-blown trade restrictions." But the relationship goes way beyond energy. European carmakers, brewers, banks and retailers would suffer from a new Cold War. The EU is also Russia's largest investor, according to the European Commission, which estimates that 75% of all foreign direct investment in the former Communist country comes from EU member states. And wealthy Russians have been drawn in ever greater numbers to western Europe, where they can take advantage of low tax rates in places like Cyprus, invest in prime real estate or educate their children. Russians accounted for 9% of all sales of London homes costing more than £1 million for the 12-month period ended in June 2013, according to estate agent Knight Frank, making them the second biggest group of foreign buyers. British private schools are benefiting from Russian money too. Figures from the Independent Schools Council show that 27% more Russian children were enrolled in a British fee-paying school in January 2013 than a year earlier, and they make up the third-biggest group -- after Chinese and Germans -- of non-British pupils.